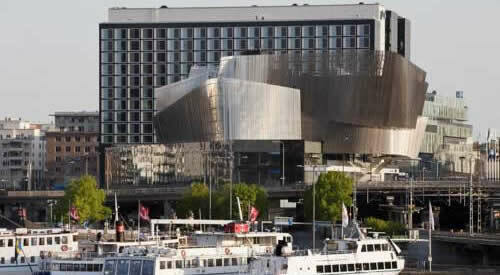 Hotel in Stockholm Sweden near Cruise Terminal Frihamnen, Stadsgarden, etc.. The Port of Stockholm consists out of several main piers. The two main cruise passenger terminals for embarkation are the Stockholm Freeport Cruise Terminal at Frihamnen (used by Royal Caribbean RCL), located in an industrial area, and the Stockholm Cruise Center at Stadsgarden close to Gamla Stan (Old Town). Best deals for pre or post cruise hotels and b&b’s near the Port of Stockholm in Sweden. Stay overnight in the Old Town (Gamla Stan), near the passenger terminals, train station, close to airports, etc.. Most cruise passengers stay in the Old Town or Gamla Stan area or nearby in Södermalm or Östermalm. Stockholm centre area is small and many attractions and sights are easily walkable wherever in the centre you stay. Many hotels are within walking distance to most sights, good restaurants and bars. Gamla Stan or Old Town is the most charming part of the city, home to the Royal Palace and full of historical sights, shops and restaurants. Collector’s Lady Hamilton and Victory Hotel are both highly recommended. Södermalm is a more residential area and within walking distance of Gamla Stan. Östermalm has many museums and is close to Djurgården. Properties in these districts are somewhat cheaper than in Old Town. Two popular and very nice properties are Hotel Rival and Hotel Diplomat. Arlanda Express arrives at and departs at Stockholm’s Central Railway Station. Several hotels are located close by convenient when travelling by train. If you’re arriving late or when having an early morning departure from Stockholm Arlanda airport (Bromma, Vasteras, Skavsta), many nice places are located nearby and have an airport shuttle too. 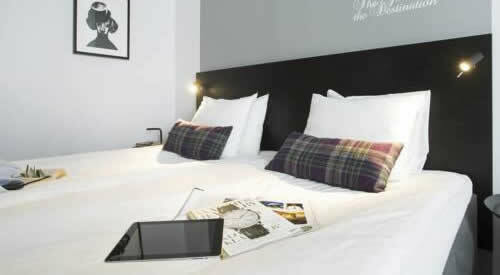 Very popular Stockholm hotel situated in the elegant Östermalm district. Luxury 4 star hotel located next to the central train station. Highly recommended by guests. Budget friendly property offering cheap deals in Stockholm city centre. The Port of Stockholm consists out of several main piers. The two main cruise passenger terminals for embarkation are the Stockholm Freeport Cruise Terminal at Frihamnen Berth 638 for larger ships (used by among Royal Caribbean RCL), and the Stockholm Cruise Center at Stadsgarden quays 165/167. Some will tie up at Vartahamnen. Smaller ships can dock close to the old town mostly at Skeppsbron. Mooring Bouy or Nybroviken 5 are alternatives. Some ships anchor further away at Nynashamn which is 36 miles south of Stockholm Sweden. Cruise ships leaving the harbour of Stockholm reach an archipelago of 24,000 islands and islets. It’s a popular area of natural beauty with lots of summer houses and chalets. It takes approximately 3 hours for a cruise ship to enter or exit Stockholm. Major cruise companies operating from the port include Royal Caribbean, Oceania Cruises, Seabourn and Crystal Cruises. Many excellent hotels, ranging from cheap to more luxury 5 star accommodations, are located within close distance in Stockholm’s city centre. Most international cruise liners dock at either Stadsgården, Skeppsbron or Frihamnen. Frihamnen : large, modern cruise passenger terminal situated on the northern outskirts of the city, 10 min by taxi or by bus in 20 minutes to the city center. Most large vessels of Royal Caribbean will dock here. Bus number 76 or 1 will take you to Gamla Stan and the center of the city. Shuttles are also often provided. Stadsgården : located right in the heart of the city on the north-east coast of the island of Södermalm, 10 to 20 min walking distance of the Old Town area. You can also take a taxi. Skeppsbron or Strömmen : situated beside the Royal Palace in the Old Town which is within easy walking distance to most shops and attractions. Smaller ships of Silversea and Seabourn can dock here. Mooring Bouy : also right in the Old Town. Nybroviken 5 : located in the city centre, 5 min walk to the Old Town (Gamla Stan). Värtahamnen 523 : located right next to Frihamnen cruise pier, 10 min by taxi or 20 min by bus to downtown Stockholm. Nynäshamn : the port of Nynashamn is located just south of Stockholm. Very large ships dock here which cannot make it through the narrow straits in the archipelago. When it is especially busy some other cruise ships may dock there as well. The dock is about a 50 minute taxi ride from the city center. There is no shortage in accommodation within easy reach of the port. Ending your cruise in one of Europe’s other fascinating cities ? You will plenty of accommodations there as well. See our hotels in Southampton, Copenhagen hotel rooms or Amsterdam The Netherlands hotels near cruise port. Many international cruise passengers will arrive at Arlanda international airport which is located about 45km or 28mi, 35 to 40 minutes away by taxi or airport bus/coach from the city centre. The express train (high-speed train) will bring you to downtown in 20 minutes. Trains run every 15 minutes. Nearest airport, but smaller. Mainly used for domestic flights and a few international flights. Skvasta is about 100km or 62mi from Stockholm near Nyköping. Most low cost carriers will arrive or depart here. You can take the airport coach to reach the city centre in about 80 minutes. A cheaper option is by taking the local bus. Located approximately 100km or 62mi to the west. Also used by low-cost airlines. 80 minutes away by airport coach service. You can also take a local bus to the train station of Vasteras, from here you can hop on a local train to reach the port of Stockholm. Sweden’s capital city Stockholm is situated on the countries east coast at the point where Lake Mälaren joins the Balitic Sea. This stunning city is often called “Beauty on Water” or “Venice of the North” because its perched on 14 islands which are connected by more than 50 bridges. The Baltic’s largest port and city is home to majestic architecture of breathtaking beauty. Visit the royal gardens at Djurgarden or admire the Palace at Drottningholm, the royal residence on Lake Maeleren. The oldest part of Stockholm is the “Gamla Stan”. This historic area is home to many great sights, hotels, nice restaurants, cafes and small boutiques. The old buildings lining the narrow cobblestone streets are dating back from the 14th century. 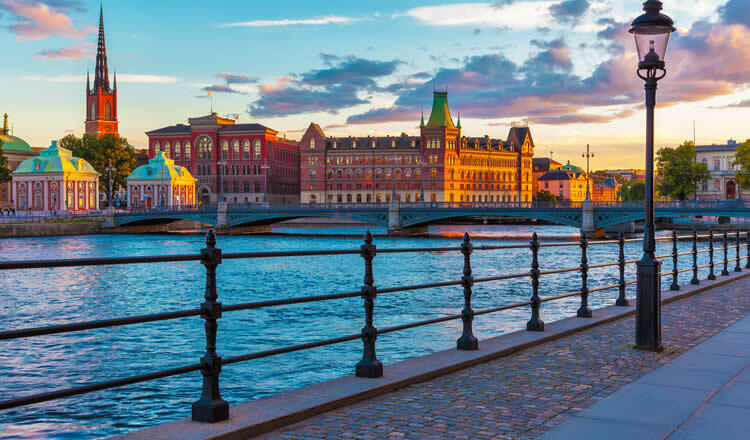 Key attractions such as the baroque style Royal Palace, Town Hall or Stadshuset with its incredible architecture and decor, The Nobel museum and Storkyrkan church can be found in the Gamla Stan. The large Royal Palace is the residence of the Sweden’s monarchs. Visit the grand reception rooms of the palace or take a look at the crown jewels, armor and art. Art lovers must visit the famous Vasa Museum, the most visited museum in Scandinavia. It displays the only preserved seventeenth-century ship in the world. Nearby is the Spiritmuseum & Absolut Art Collection, dedicated to alcoholic beverages. A great and fun way to admire this city is by taking a boat tour along its pituresque canals. You will travel through narrow canals, pass many historical buildings, museums and beautiful green areas. Sweden’s currency is the Swedish Krona (SEK). Currency converter.